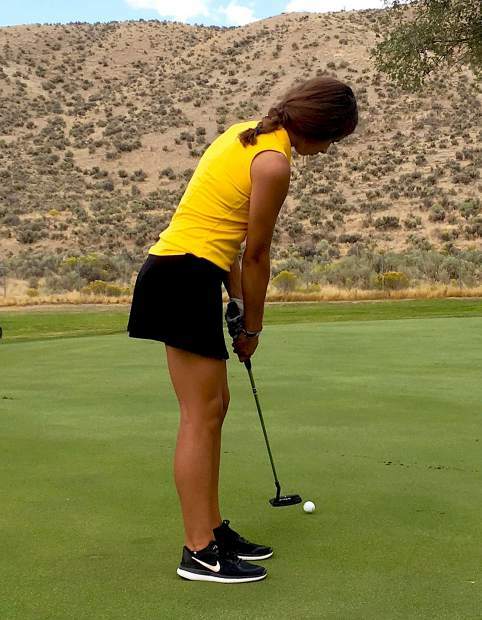 Sophomore Macy Cannon putts during a match Sept. 6 at Ruby View Golf Course in Elko. SOUTH LAKE TAHOE, Calif. — Four South Tahoe golfers recorded personal bests Tuesday to lead the Vikings to their best Northern League finish in three years. Junior Jenna Shortridge led the way for the Vikings during the Northern League meet at Ponderosa Pines Golf Course in Truckee, with a 102. She is in fifth place in the individual league standings and would qualify for the state tournament in October if she holds or improves on the ranking. The top three teams qualify for the state tournament, along with the top five girls who are not on the qualifying teams. Following Shortridge, senior Sydney McCarthy, in her first year of varsity golf, shot a 110, sophomore Macy Cannon shot a 111, and senior Hannah Heidel had a 113. Alia Enriquez, a junior, and freshman Marley Lauer both shot 125 for the Vikings, but their scores were dropped, as only four out of the six scores are used in the team scoring format. South Tahoe’s 436 total team score was good for fifth place. Lowry won the tournament. The Vikings this year have used eight players at the varsity level, as competition is fierce for the six-person tournament team. The Vikings next will play Oct. 1 in Dayton and in Fallon, Nev., the following day.